Myron Lysenko, Convenor of Chamber Poets Launched Still Life With Grandmother by Christopher Race, Pomonal Publishing 2015, at the Chamber Art and Coffee House, Woodend, on 14th March. 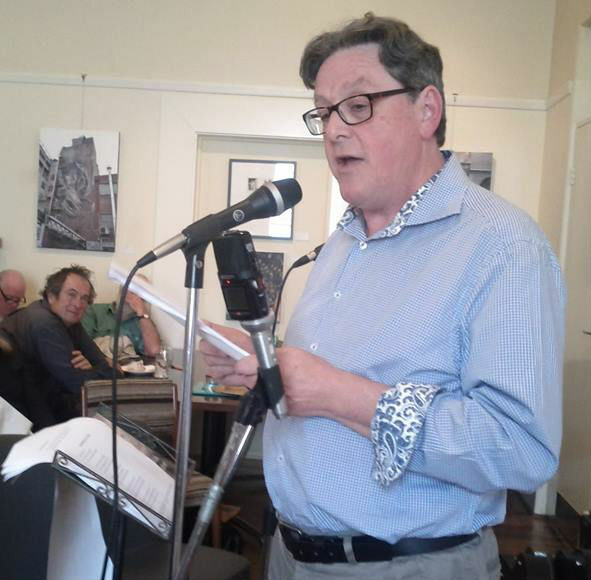 Christopher Race reading at the launch of Still Life With Grandmother at Chamber Poets, Woodend. Welcome to the celebration of Christopher Race’s first book of poetry. The poems in this book are accessible yet deep, serious yet subtly funny. They contain fearful and lonely thoughts in juxtaposition with domestic imagery. Music and the garden are recurring motifs. There are windows through which the poet looks both outwards at scenes going past his life and within as he recollects dead relatives and loved ones who have enriched his life or bullied him into a man who has difficulty in expressing his love. This is a sophisticated and assured debut. Christopher Race’s distinctive and calm voice is a welcome harmony to the chorus of Australian poets. I hereby declare that Still Life with Grandmother has been officially launched into the universal world of books. Myron Lysenko has published six books of poetry and is the convenor of Chamber Poets, a monthly reading in Woodend, Victoria. This entry was posted in Christopher Race, Issue 14, Myron Lysenko, Pomonal Publishing, Still Life With Grandmother and tagged Australian Literature, Australian poetry, Chamber Poets, poetry by Mark Roberts. Bookmark the permalink.